A request type determines how alerts are routed to the appropriate tech for problem resolution. When you create your SolarWinds connection, select the request type that closely matches the connection. 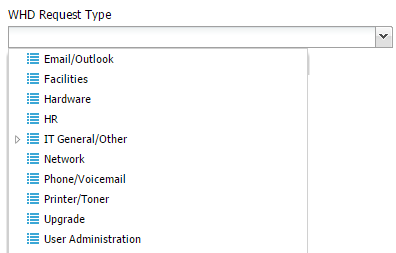 You can select one request type for one SolarWinds connection. For example, if you are creating a connection to SolarWinds SAM to address alerts related to server health, click the WHD Request Type drop-down menu and select a request type linked to a tech group that troubleshoots and resolves server issues.